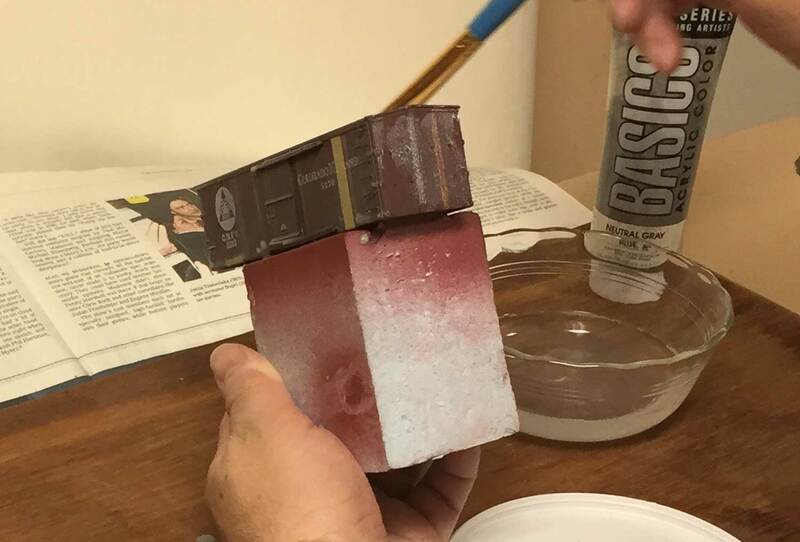 This box car illustrates the result of weathering washes outlined in this blog post. A recent weathering blog post generated questions about the washes used in the processes. 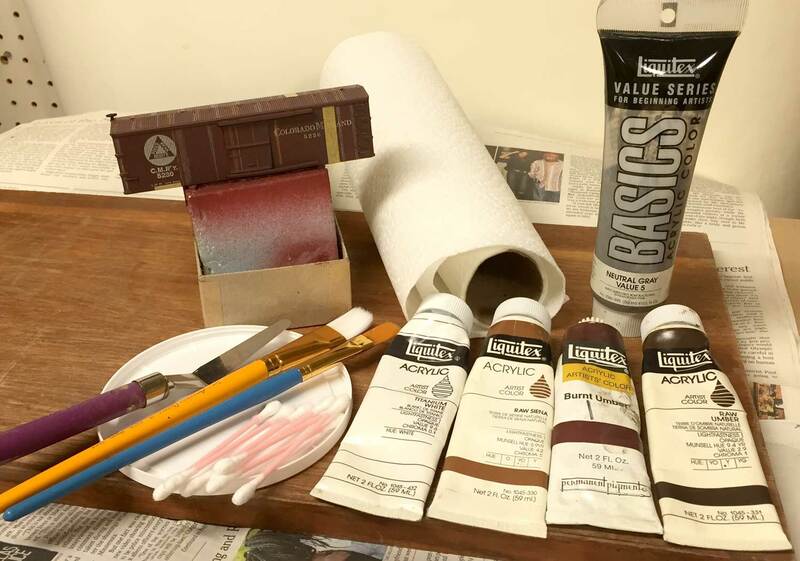 Let’s take a look at the materials and the steps I use in applying weathering washes to freight cars. A wash is a very thin application of paint. A little paint combined with much more thinner can go a long way. I usually apply a weathering wash to a few models at a time to maximize my efforts. Acrylic paint and distilled water are the main components of the washes I apply. A small dish contains the water with a drop of dish detergent added. The detergent reduces the surface tension of the water and enables the liquid to flow easily. Yogurt container lids are on hand to use as paint palettes. I used wide flat brushes to work the weathering washes onto the freight car surfaces. I’ve been using the Liquitex acrylic brand for a number of years. Basic colors can be found in economical size tubes at many big box craft stores. Here are the basic colors I keep at hand. These last a long time and can be used for scenery and other hobby tasks. Tubes of white and black are handy to lighten or darken other colors. I picked a model for this demonstration and gave it a good wash with a toothbrush and dish detergent. Once it was dry, Prismacolor pencils were used to alter the shades on various boards. A flat coat was applied to seal these colors, which would be a mistake as we will see further along in this post. The car body was mounted on a piece of scrap Styrofoam to hold the model for the washes. A paper towel tube is another option. I wanted some of the original paint color to contrast with the worn areas of the car, so Tamiya 6mm wide masking tape was used to cover some areas of the car sides and roof. The reporting marks were covered so it would look like they were repainted on a patch of fresher paint after the wash was complete. One piece of tape covered a few roof boards. The running board has been removed as it will be replaced with thinner stripwood. Everything is ready for action in the above image. Wet the model using the brush. Just dip it into the water and spread the water around. You may need to do this a couple of times. Pick up a very small portion of paint with the wet brush. I often brush this on newspaper to make sure I don’t have too much on the brush. Start on the roof and brush the paint in the direction of the roof material. For this model, I brushed from the center of the roof to the edge. If there is too much paint, just dip the brush into the water and apply it to the model. Paper towel and cotton swabs are good tools for sopping up any excess or removing too much paint. It takes practice to get the feel of the material and how it works into the model details. Buy some old plastic models at a train show to use for practicing. These don’t even need to have trucks or couplers. After the roof, work on one side at a time. The wash will naturally flow down the car side to the bottom. Continually pull the wash up from the gathering points along the bottom of the car sides and ends. When it starts to look good, blow on the model to accelerate drying but keep moving the material up from the bottom of the sides and ends. Once the wash has set up, set the model aside to dry overnight. If you live in a very dry area, the work may be completely dry in a couple of hours. For models that cannot be removed from the underframe, I tip the model with my finger on the end of the running board. I often work on the ends of these cars first by holding the car. The roof and sides are done after the ends have mostly dried. Sometimes I will apply a second wash using a different color. If you plan to apply another wash, spray the model with a flat coat to seal the work. I have washed away previous work when applying a second wash. It’s disappointing to watch that happen. 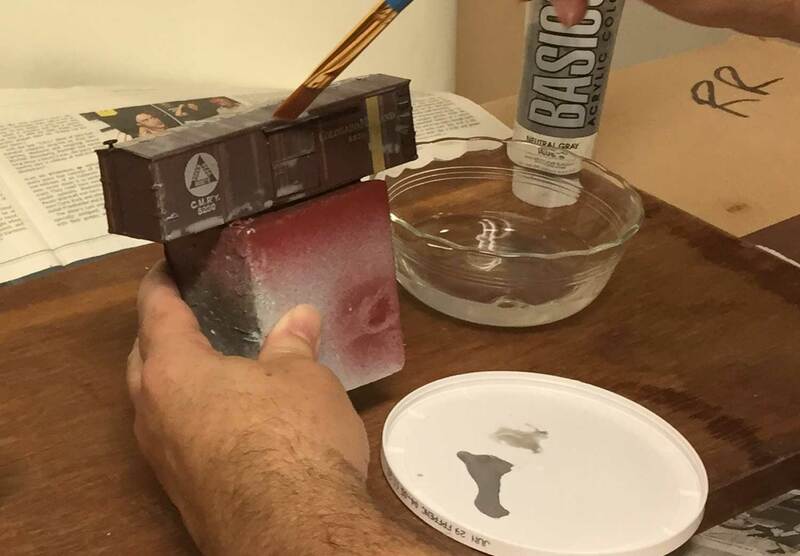 Oil-based paints can also be used for weathering washes. I use mineral spirits as a thinner and follow the same steps outlined above. Oil-based paint can take longer to dry. After the final wash, seal the work with a clear flat coat. The flat coat offers better surface tooth for PanPastel or chalk applications of dust, grime, and/or soot. Here’s the demonstration model after a couple of washes were applied. I was disappointed the tape covered areas are not as distinct as I expected. I’ll have to work on that. Of course, I usually add PanPastel colors for additional weathering layers that could have blended everything together. I will reapply the masking tape and add PanPastels to see how it looks after my usual steps. I just wanted to demonstrate weathering washes with this post. As noted earlier, I should not have sprayed a clear flat coat to seal the Prismacolor pencil shading. That work stands out too much, even after two acrylic grey washes and an oil-based burnt umber wash. On recently weathered models, the clear flat coat was not added before the wash and the Prismacolor pencil shading is less obvious. Chalk one up for learning! Your first results may not be satisfactory but you can’t improve your efforts without working through these processes a number of times. Some of my early work from the 1980s is cartoonish compared to recently weathered freight cars. Weathering washes are an easy way to alter the look of new freight cars. The new model shine disappears with just a light wash. It all boils down to just a little paint, a lot of thinner, and patient work with a brush. You will become more confident with each model you weather. Very informative, Eric… thanks for the info. One question… When I send my freshly painted and lettered freight cars over to you in El Paso, would you prefer them a dozen at a time… or a half dozen??? Great tutorial, as usual! Waiting for the wash to dry was frustrating to me and kept me from getting cars done. I learned a great tip at Trainmasters TV to speed drying–a space heater! Adjusting the distance from car to heater to dry quickly while avoiding melting plastic detail is the only skill involved. I can then go even lighter in volume of wash added but get 2-3 layers on in an hour! Layers mean depth of finish. This worked for flat coat spray too. I thought the space heater might turn my workbench into a sauna, but I did not find it to do that, even this summer. I turn it on a shorter time than I originally thought I would need. Happy weathering! Eric, many thanks for this excellent tutorial. It will enable others to follow in your path. When I used the water based idea I had problems with bubbles forming form the wet water? Thanks for the advice I will try again. 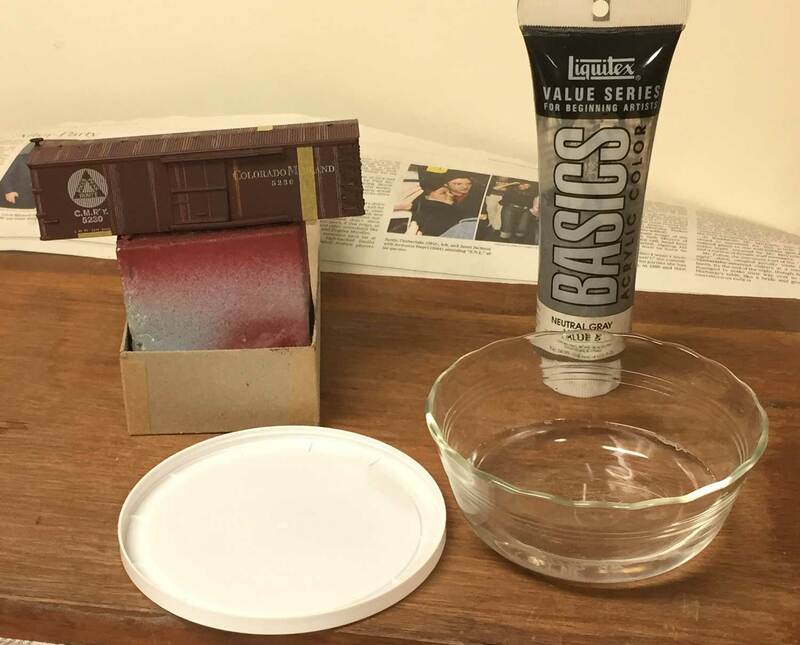 Eric, Thanks for the excellent tutorial and posting your observations of spraying the flat over the prisms colors. Thank you for this. I appreciate it. I have gotten several cheap cars to practice on before tackling my civil war era cars. I will be printing this off to hang by my paint bench!